Michael Ferber is professor of English and Humanities at the University of New Hampshire. He has recently edited (and partly translated) the anthology European Romantic Poetry (New York: Pearson Longman, 2005) and completed the second edition of A Dictionary of Literary Symbols (Cambridge: Cambridge UP, 2007). He may be reached at mferber@cisunix.unh.edu. C. S. Matheson teaches romantic literature and visual culture at the University of Windsor, Ontario. Her current projects on romantic spectatorship include a book on the invention of public art exhibition in the period (which does feature Blake) and a collaborative investigation, with Alex McKay, of the Claude mirror and constructions of landscape called “The Transient Glance” <http://www.claudemirror.com>. Jennifer Davis Michael (jmichael@sewanee.edu), professor of English at the University of the South in Sewanee, Tennessee, is the author of Blake and the City (Bucknell UP, 2006). Morton D. Paley recently completed Samuel Taylor Coleridge and the Fine Arts, which will be published by Oxford in 2008. Wayne C. Ripley is an assistant professor at Winona State University. He is working on a project involving Blake, Young, and the tradition of devotional radicalism in the long eighteenth century. 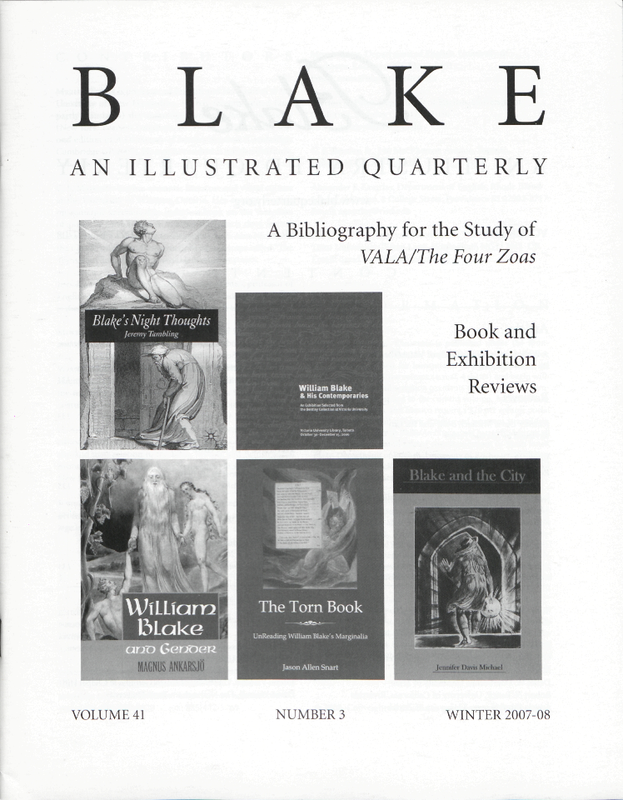 G. A. Rosso (rossog1@southernct.edu) has authored and co-edited a number of books and essays on Blake’s epic prophecies and their relation to the Bible, Milton, and British social history. He teaches English at Connecticut State University in New Haven. Justin Van Kleeck (jsvk13@vt.edu) is an adjunct assistant professor of English at Piedmont Virginia Community College in Charlottesville, Virginia.